The 1st Infantry Regiment of Sarrebourg, the first regiment to be outfitted with the French Army's new FELIN integrated equipment suite, was at the Combat Training Center (CENTRAC) in Mailly-le-Camp, 300 kilometers east of Paris, to continue its training in August. Then, immediately, before deployment in Afghanistan in December, where its mission is to join the La Fayette Task Force; the Battalion went to Canjuers to familiarise its enlisted soldiers with an environment close to that of the mountains of Afghanistan. Training at Mailly-le-Camp, of a FELIN combat group with a VBCI combat vehicle. Photo Ph Wodka-Gallien. © Sagem. In Canjuers military camp, a demonstration of the use of the SITEL Lieutenant & BMS - SitComdé - Photo Ph Wodka-Gallien. © Sagem. Some 700 FELIN-equipped soldiers in three battle groups were deployed, supported by Nexter Systems’ VBCI, VAB and AMX-10RC armoured vehicles. They faced scenarios based on real situations encountered in Afghanistan, against seasoned warfighters. On the agenda for this training exercise were: controlling valleys, IED searches, reconnaissance missions, weapons searches and face to face contact with the population. Combat in open terrain and inhabited areas were of course at the menu. Prior to their training at the CENTRAC training centre, these troops had already undergone exercises at the CEITO center in Larzac for training in operational fires and the CENZUB center in Sissone, 200 km east of Paris for an intensive course on urban combat. Preparations culminated with a month-long combined training programme in Canjuers, just prior to deployment in Afghanistan. This intensive programme addresses both field and command units and has been conducted under the auspices of the Force Preparation Centre Command, dedicated to the preparation of armed forces and created in 1997 at Mailly-le-Camp. Preparations by the 1st Infantry Regiment for deployment had in fact already started in September 2010, right from the time FELIN systems were first delivered to Sarrebourg, the Regiment's base in eastern France, after they learned they would be going to Afghanistan at the end of 2011. The first months were dedicated to training on the new FELIN system and learning tactical procedures. Actually, for the French army, FELIN reflects the intersection of technology and history. The 1st Infantry Regiment, the first unit to be equipped with a production-standard high-tech integrated system for dismounted combat, is in fact the oldest regiment in Europe. It was created in 1479 by a decree from Louis XI. Ironically, this centuries-old unit has become the most modern infantry regiment in the world based on digitization and network centric technologies. This picture shows FELIN with the Minimi in a reaction against an attack on the “FOB” at Canjuers. This image underlines the use of the IR aiming sight on the FELIN system. At Canjuers military camp, the army rebuilt a FOB, identical to those in Afghanistan, to prepare the soldiers before their deployment. The mountains outside are also similar yo those in Afghanistan. Photo Ph Wodka-Gallien. © Sagem. The commanding officer of the 1st Infantry Regiment was very enthusiastic about the FELIN system made by Sagem, part of the Safran group and prime contractor for this programme, conducted under the general leadership of French defense procurement agency, the DGA. He says that, "FELIN's fundamentals are up to our expectations," and sees the system as a very complete, easy to use suite, with soldiers calling on the functions needed to carry out each mission. All troops were able to master the system's use, and take maximum advantage of its modular design. Daytime operations mainly used streamlined configurations, including the RIF soldier radio system, daytime sights and the ballistic protection vest. The new optics in the FELIN system significantly boosted the French army's operational capabilities, by doubling range for night firing. Everybody agreed that the optronic equipment – infrared or image intensification aiming sight, JIM MR (Medium Range) multifunction IR binoculars – provided a decisive advantage, especially for night operations, notably in protection scenarios. The JIM MR binoculars, for instance, are used by the section leader for observation before an assault, enabling fast identification (at an average range of 1000m), or to transmit precise target coordinates to the commanding officer to request fire support. Participants noted a 1,000m range for the RIF radio network in open terrain, plus 600m effective range for the FAMAS rifle, 800m for the sharpshooter with an FRF2, and 72 hours run time for a platoon during combat. For leaders of the 1st Infantry Regiment, FELIN expands the scope of action at platoon level, while also allowing very stealthy infiltration manoeuvres. This tactic is greatly facilitated by the system's osteophonic headband, enabling radio communications to be whispered. 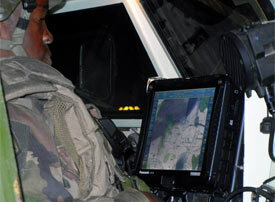 Applying digital battlefield principles, the 1st Infantry Regiment also practiced exchanges between the Battle Management Systems (SIT/Tacmaster terminals in the French Army designation) mounted on a VBCI armored vehicle, the Sitel battle management system and the SitComdé terminals (BMS) used by platoon leaders and specialised section leaders via the PR4G tactical VHF transceivers already in use. The fleet of VAB armoured vehicles was adapted to the FELIN systems for the 1st Infantry Regiment, including the installation of an onboard battery charger, a wired network to recharge systems at each seat, a charging station for JIM binoculars, and a rack to store FELIN modules. Based on the results of an exercise involving taking a village by force, the FELIN's C3I system also enhanced the use of infantry weapons not integrated in the system, including rocket launchers such as the AT4, HK417 sharpshooter rifles, and carriage of mine and IED detection devices. During a manoeuvre, the FELIN platoon is supported by VAB based Observation Artillery Vehicles and IED Jammers, also mounted on a VAB. The Regiment's HQ also went to the Command Station Training Centre. Operating under NATO standards, it uses the Scipio command simulator system. Another lesson learned from the training programme at Mailly is that FELIN was easily integrated in the Centaure digitized training system used by CENTAC, enabling the real-time monitoring of manoeuvres from its operations center. Concerning the step of Canjuers camp, every soldier confirmed the advantages of the modularity of the FELIN system, enabling them to adapt the configuration towards the missions of the day. FELIN is the first integrated and comprehensive combat system for dismounted soldiers in Europe. 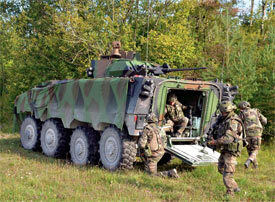 To date, the French army has ordered 22,588 systems, and 6,000 have been made operational by the end of 2011. Upgrades to the system are already planned, and will draw on its modular design. The “Vehicle-mounted RIF”, a dedicated version of the current RIF, is a new radio system developed also by Sagem that will ensure communications continuity between the vehicle commander and the dismounted combat section. Versatile and modular, the system is open to further developments, depending of the needs of the forces. Concurrently with the FELIN programme, the BMS tactical terminal used by the section leader also showed its ability to control the Cobra (ECA) mini ground robot during the Phoenix 2011 demonstration in Mourmelon in May 2011. In addition, the system supported the transmission of images acquired by the Novadem Dragonfly minidrone. FELIN's modular design is obviously a big hit with the members of the 1st Infantry Regiment. 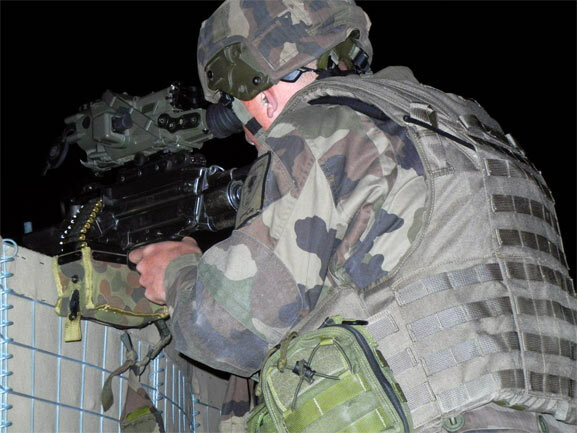 This feature also shows how the new French system can unify various modernisation programmes for infantry units, at both the individual and collective levels, using off-the-shelf equipment and available technologies, as well as those now under development.